Minimum Wage Increases: Too Good To Be True? Recently, there has been much debate on whether or not to raise the federal minimum wage from $7.25 to a new, higher $10 or $11 minimum wage, some workers even calling for $15. These meager salaries, they say, are just not enough to get along. Liberals and many conservatives alike have called for a “living wage”. President Obama and Senate Democrats began pushing for such hikes in workers’ salaries since February this year when they proposed $9, but revised their plan, boosting the wage up to $10.10. This they say, would bring “58 percent of the nation’s 10 million-plus working poor out of poverty.” This assumption, however, is flawed. It assumes that companies would employ at the same rate as they do now and not lay anyone off. Basically, it rest on the assumption that a government decree can suspend supply-and-demand and other basic economic phenomenon. The minimum wage does not work as intended because artificially overvaluing a commodity, whether it be milk or bread, or a worker’s labor, causes people to buy less of it. Let’s say, for a moment, that I am not talking about a salary, but the price of a commodity. Let us say that I am a baker. I may sell my bread at $3 a loaf, because that’s how much it is worth. Now, let us say, a politician comes along, with completely good intentions, believing that bakers deserve more money for every loaf they sell. He raises the minimum price of a loaf of bread to $4 per loaf. While this may appear to both politician and public as a blessing from the government, what it does in reality is hurt both the consumer (in this case, the customers of the bakery) and the producer (me, the baker). Tim used to come around every Thursday to the bakery with $15 with which to buy bread. Before the new law, he could purchase 5 loaves, and I would be paid $15 dollars. Now he can only purchase 3 loaves, and only pay me $12. You may be wondering, what the hell does this baker analogy have anything to do with the minimum wage? My answer to that is that it has everything to do with minimum wage, for wage is, in fact, a price. An employee’s wage is that price that he charges the employer for his work. Since wages are prices, the same principles affect both. Let us say now, that my bakery has been very successful and I’m going to hire $100 an hour’s worth of new employees. If I pay each $7.25 an hour, hire 13 new employees. Now the minimum wage is raised to $10, and I’ll only hire 10 new workers, or $15, and I’ll only hire 6. What a minimum wage does is replace low wages with unemployment. Just like my loaves of bread, the job market cannot evade the law of supply-and-demand. The great thing about the free market is that even if someone is unskilled and is only able to produce a small amount of money, the market lets him do that. But you cannot make the worth of a man’s work greater by making it illegal for anyone to pay him less. What you are doing is making it illegal for that man to work. 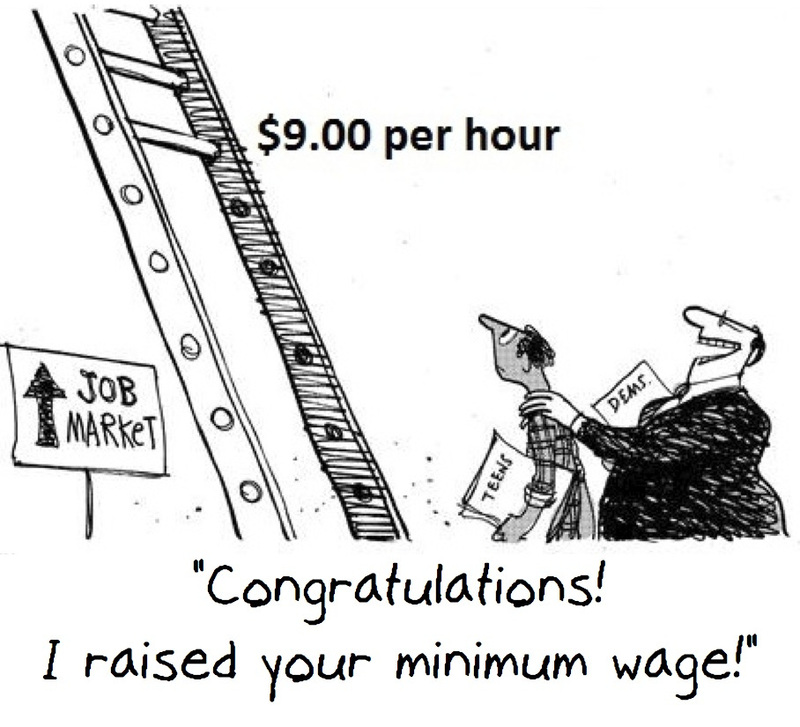 There are other ways to go about raising wages. One’s salaries are determined by how much wealth they create. Therefore, in order to raise the value of one’s work, they should increase how much wealth the create– increasing productivity. By innovating, inventing, and working more efficiently, one can increase how much they generate. If someone is actually being paid less than how much their work is worth, they can simply not work for that employer. If the employer is paying to little, people will decide not to work for him, they will move into other industries or unionize against said employer. Having a central leader decree how much whoever anyone gets paid is the worst way of raising wages. I’ve started learning code. Wish me luck!